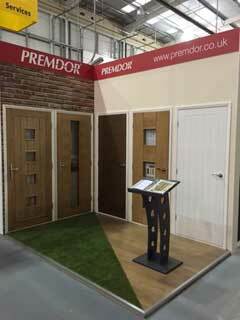 One of the UK’s best-known door manufacturers has revamped its popular stand at the National Self Build & Renovation Centre (NSBRC) – Europe’s only permanent venue exhibition designed to aid those undertaking a self-build or home improvement project. Barnsley-based Premdor has had a physical presence at the pioneering venue since 2006, but after launching several new product ranges, the company decided to overhaul its previous stand to instead focus on creating an inspiring space for aspiring self-builders and renovators. The captivating stand now features five of Premdor’s most popular door styles, each hung within a two-sided replica of a typical home. Inquisitive visitors will be able to fully open each door outwards, allowing them to obtain a full view of the door and aiding their door choice. In addition, Premdor has also utilised aisle displays within the Finishing Touches area of the centre. Further information on each door style is also featured on graphic panels affixed behind each and every Premdor door within the centre. The NSBRC is open Tuesday through to Sunday with free admission at all times. The centre encompasses over 200 permanent trade stands, educational theatres and three full-scale exhibition homes, displaying the latest construction methods and home technologies. Jon Walker, Brand Director at Premdor, is delighted with Premdor’s new permanent stand. Jon explains, “We wanted to create a space that was both visually appealing and inspiring, whilst still attractive to the typical homeowner”. “We decided, that by creating a homely set-up, representative of a typical dwelling, we would then automatically appeal to those about to begin such a daunting task and help make it a less arduous one. We also wanted to encourage visitors to contact us, via phone or email, to help answer any technical questions or design queries they may have, which is why we have ensured the stand is interactive, yet welcoming”. Visit Premdor at Stand No. 131 in 2015 and be inspired by the latest door designs and technologies. To book your free NSBRC ticket, please visit www.nsbrc.co.uk. For more information on Premdor, please visit the About Premdor page.